This is a piece I wrote my Masters of Journalism degree and was published in Newcastle Mirage. Thanks to the advent of Instagram, the world of online marketing through the use of personalities with large followings has quickly become the norm, and making a living off essentially being a promotion tool more viable. We all know about the big bucks some social media stars are getting paid to post a picture of them holding up their “favourite” teeth whitening product or skinny tea. However, as those big accounts become saturated with promotional material, the public loses interest and trust, and that’s where mircoinfluencers have come in to steal the spotlight. Brands and PR companies are now also targeting those known as mircoinfluencers; people who have a smaller, but loyal following, with 55% of agencies choosing to incorporate mircoinfluencers as part of their marketing strategy. These smaller Internet personalities seem more “human”, approachable, trustworthy and credible to those who loyally follow. As Caroline Johns, Managing Director at Raw Vision Marketing, highlights, this more authentic connection to their followers really shows that less equals more. Recently moving into full-time blogging after being in the online world for seven years, Peta Serras, from the Maitland based online publication Professional Babe, also agrees that mircoinfluencers have a better connection with their following. “I believe smaller influencers have more of a pull with their audience. Because they've built relationships with their following and they usually interact with them, when they recommend something, it's like the recommendation is coming from a friend. I think brands are seeing a better return on investment too because of this”. 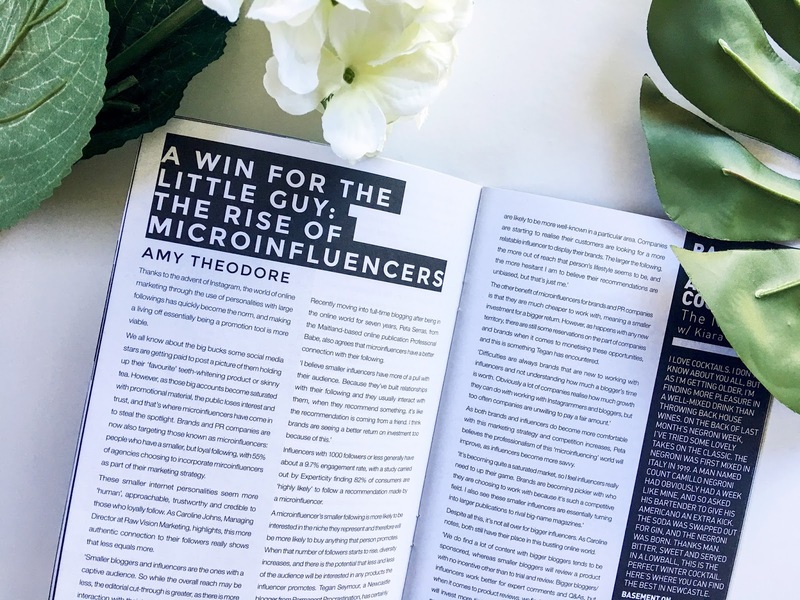 Influencers with a 1000 followers or less generally have about a 9.7% engagement rate, with a study carried out by Experticity finding 82% of consumers are “highly likely” to follow a recommendation made by a mircoinfluencer. A mircoinfluencer’s smaller following is more likely to be interested in the niche they represent and therefore will be more likely to buy anything that person promotes. When that number of followers starts to rise, diversity increases, and there is the potential that less and less of the audience will be interested in any products the influencer promotes. Tegan Seymour, a Newcastle blogger from Permanent Procrastination, has certainly noticed this pattern. The other benefit of mircoinfluencers for brands and PR companies is they are much cheaper to work with, meaning a smaller investment for a bigger return. However, as happens with any new territory, there are still some reservations on the part of companies and brands when it comes to monetising these opportunities, and this is something Tegan has encountered. “Difficulties are always brands that are new to working with influencers and not understanding how much a blogger’s time is worth. Obviously a lot of companies realise how much growth they can do with working with Instagrammers and bloggers, but too often companies are unwilling to pay a fair amount”. As both brands and influencers do become more comfortable with this marketing strategy and competition increases, Peta believes the professionalism of this ‘mircoinfluencing’ world will improve, as influencers become more savvy. Despite all this, it’s not all over for bigger influencers. As Caroline notes, both still have their place in this bustling online world. “We do find a lot of content with bigger bloggers tends to be sponsored, whereas smaller bloggers will review a product with no incentive other than to trial and review. Bigger bloggers/influencers work better for expert comments and Q&A’s, but when it comes to product reviews, we find the smaller influencer will invest more time and energy into trialing the product and providing a more in-depth review”. I LOVED This blog!! I see the losing trust bit actually, and I'm glad that the micro Influencers get a shot too, it's true they are cheaper and have a good engagement. It's so great to see companies finally acknowledging how effective this type of PR is!